It's off the press and through the bindery! Over 100 pages of creative expression from a handful of artists, poets and writers. This little hardbound book is our best yet and you can get a copy for only $25 and we will ship it to you for free! Here is a sample of the good things you'll find between the covers of our new book: One Thing After Another! ﻿﻿﻿...and we are already working on the next issue! We are always accepting new submissions for the next Jimmie Harvey & Friends book, published each fall by About Time Publishing. Besides looking for new poetry and essays from new authors, we are seeking photographs, paintings, drawings and other works of art. Jimmie Harvey & Friends books are a great way to share your work with others through a limited publication (short press run). Books are published each year in early December and consists of non-paid submissions from a select few writers and artists. Each author/artist who's work is accepted and published receives a complimentary book and access to additional copies at a nominal cost. Guidelines: The fewer the rules, the better the material! 1. Submissions need to be something that can be printed. In other words, even with the marvelous tools at our fingertips, we can't include audio or video clips in a printed book. But we can accept paintings, photos, drawings and almost any type of original as input, as well as electronic text and computer generated (digital) graphics and photos. 2. We won't print vulgarity, profanity or anything distasteful to our readers. This includes racial and religious slurs and anything intended to degrade or otherwise do harm to anyone. Submissions are subject to review by the editor. We reserve the right to reject any material that does not meet our standards of decency. 3. Deadline is Thanksgiving weekend 2016. All submissions will be reviewed and the author/artist contacted promptly regarding the status of their submission. 4. Note that all submissions are unpaid at this time. 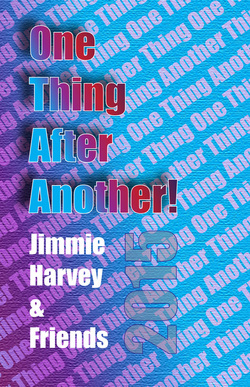 Jimmie Harvey & Friends is produced at near cost to provide a fun and creative and affordable experience to authors and artists and their families and friends.